Bolivarian National Police stand behind a burning roadblock set up by anti-government protesters who are showing support for a mutiny by some National Guard soldiers in the Cotiza neighborhood of Caracas, Venezuela, Jan. 21, 2019. 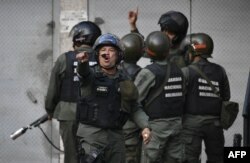 Venezuelan security forces have arrested 27 National Guardsmen, after they allegedly revolted against the government of President Nicolas Maduro, the Defense Ministry said. The ministry said "a small group" of National Guard members had taken four hostages and stolen weapons from an outpost in Caracas' Cotiza neighborhood during a pre-dawn insurgency. Venezuelan officials said the 27 were arrested and more could follow as the investigation unfolds. Members of the Bolivarian National Guard throw tear gas againts protesters near Cotiza Bolivarian National Guard headquarter in Caracas, Venezuela, Jan. 21, 2018. The military said it had recovered all the weapons and captured those involved in what it described as "treasonous" acts motivated by "obscure interests tied to the far right." It said the revolt began at around 2:50 a.m. local time when the men took over a police station in western Caracas. They then moved across the capital in two military trucks to the poor neighborhood of Petare, where they stole a cache of weapons from another outpost. They were arrested a short time later at a national guard outpost 3 kilometers from the presidential palace. Anti-government protesters face off with security forces as they show support for an apparent mutiny by a national guard unit in the Cotiza neighborhood of Caracas, Venezuela, Jan. 21, 2019. 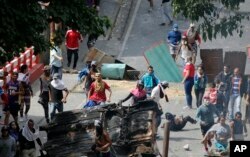 The failed revolt sparked protests in the poor neighborhoods of the capital as the news spread. At daybreak in Cotiza, a group of young men built a barricade across the street with a burning car, heavy sewer grates and a large chunk of concrete. "Freedom! Freedom!" they chanted. "Maduro has to go!"